Peter James is an impressively prolific bestselling thriller writer, of whose books I had before now read precisely none. 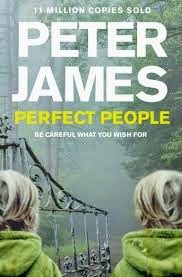 I picked up Perfect People at a low-price book sale along with various other thrillers this summer because I was keen to know what Peter James does that sells so well, and because I was interested in the subject matter: a couple who agrees to have a genetically engineered son to avoid losing another child to the hereditary disease that killed their first baby, Halley, at the age of four. Perfect People brings to mind of those high-concept, borderline sci-fi thrillers that were popular in the 1970s – think Ira Levin’s The Boys From Brazil or The Stepford Wives. As such, despite its contemporary themes of ‘designer babies’ and elements involving a religious fundamentalist terrorist organisation, there is something about it that feels oddly dated. This isn’t helped by the slightly Bond-villainish character of Dr Dettore, the geneticist who convinces John and Naomi Klaesson to agree to have a child with favourably tweaked genes. To avoid having to conform to US or European law, his clinic is located at sea on board a mysterious cruise liner, and there are chapters set on a mysterious island that can’t be located on a map. For the duration of the book, I rather felt as if I was reading a novelisation of a film, and not a recent one at that. Perfect People's plot certainly does make you want to plough on quickly to end, despite the enormous suspension of disbelief required. I did keep turning the pages, despite my misgivings about elements of the story and frequent irritation at the writing style (heavy on the telling, light on the showing, and peppered with mundane exposition). I don’t, however, think the story that will stay with me, and I felt none of the chills or unease that the ‘perfect people’ of the title should have conjured up. John and Naomi’s designer children (apologies if you consider this a spoiler, but the fact that there are two of them is already annoyingly revealed by the book’s own cover art) are obviously not like other toddlers, but their 'otherness' is all cliché: the idea of the cold, insular, unnaturally academic, freakishly beautiful and potentially psychic blonde child is a familiar one from The Bad Seed or The Midwich Cuckoos. They may be called ‘New People’ in certain quarters, but there’s nothing really new about them from the reader’s point of view. Moreover, the relationship between parent and child here is infuriatingly inconsistent – neither parent is really shown to bond with their children as such, and Naomi in particular behaves as if she actively dislikes or even fears them, but suddenly when required for the purposes of the plot, they suddenly begin to behave completely differently towards them. I fully understand that the parent-child relationship is a complex one, but I don’t find the sudden turnaround in Naomi’s maternal instincts particularly credible. Other inconsistencies include the claim that the ‘new people’ abhor violence, which seems deeply out-of-kilter with the children’s ability to butcher their own pets or inspire outright terror in the other toddlers at their playgroup. A bit of a wasted opportunity, this one. Plenty of potential, but just felt careless in the execution, as if the author was taking a paint-by-numbers approach to fiction.